Los Angeles Lakers center Pau Gasol (16) is guarded by New Orleans Pelicans power forward Anthony Davis (23) during the first half of a game at New Orleans Arena. 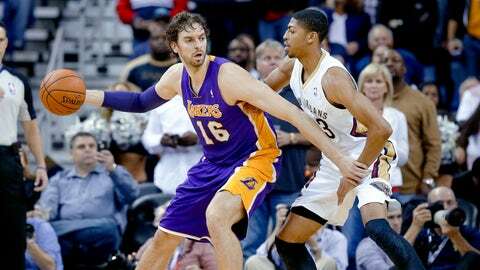 CLEVELAND — The Cleveland Cavaliers and Los Angeles Lakers are deep in talks about a trade that would swap Cavs center Andrew Bynum for Lakers big man Pau Gasol, sources from both sides told FOX Sports Ohio on Tuesday. ESPN reported the story first. The Cavs suspended Bynum this past weekend for conduct detrimental to the team. He is no longer suspended but remains excused from team activities. League sources confirmed reports the Cavs are actively trying to trade Bynum by Jan. 7. If he is traded or waived before then, just half of his $12.25 million salary would be due. One NBA executive told FSO on Thursday night "they’re clearly aggressive" in attempts to trade Bynum. The exec said he has not spoken to the Cavs, but has heard about their maneuvering from front office members of other teams. Bynum, 26, has labored through the early part of the season after sitting out all of last year with the Philadelphia 76ers with knee issues. The 7-footer has played in 24 games for the Cavs (19 starts), compiling averages of 8.6 points and 5.3 rebounds. He admitted earlier this season that the pain in his knees has him contemplating retirement. His suspension and now paid leave from the Cavs, however, is the result of conflicts with the front office and coaching staff, sources said. Meanwhile, Gasol has butted heads with Lakers coach Mike D’Antoni for much of the early season. Sources familiar with the situation say Gasol is unhappy with his role and would welcome a trade. The Lakers are slowly accepting the idea of needing to rebuild after the knee injury to star guard Kobe Bryant, sources said. Bryant played just six games after returning from a ruptured Achilles’ tendon, suffered at the end of last season. Trading Gasol’s $19 million contract, and then shedding money by waiving Bynum after a trade, would free up space under the salary cap, and therefore, allow the Lakers to focus on other moves and the offseason. In return, the Cavs would receive a productive big man whose contract comes off the books at season’s end. At least one player other than Bynum or Gasol would need to be involved, per league rules, according to the ESPN story. Gasol, 33, has suffered from an upper respiratory infection recently but is expected to return to action Tuesday. He is averaging 14.7 points and 9.4 rebounds in 28 games.